Yes! Finally for two months, i finished my official wedding book for my client. Richard and Melissa. 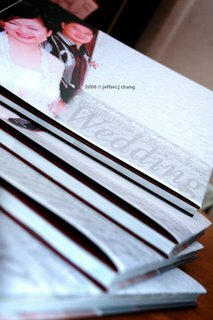 It took me a long time to put this things done starting with the photo taking, touching up selected photo, layout designing and the last printing and binding. It is not a hard work but tiring to my mental and mind as i always need to think ahead of a new and interesting design suits to the couple’s personality. Not an easy thing to do. 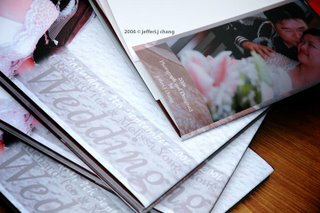 There are some difficulties on process of creating this book such as the color, client proofing, printing in which very difficult during hari raya holiday and especially the paper alignment front and back. 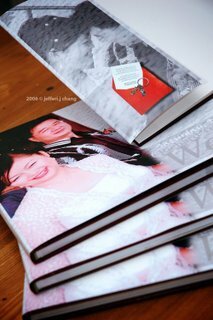 I took some photo of the book before i gave it to my client by tomorrow or the day after. Although i admit there was something unsatisfying on the printing, i hope they have no rejection on it. Just need to pray harder. update: Here is the link of the album layout.